Treasure Island: A polluted military base is being transformed intoa dense green neighborhood. Today it is an almost completely paved naval air base built atop earthen material dredged from the San Francisco Bay in the 1930s. By 2020 it is scheduled to become one of the most sustainable communities in the U.S. According to a master plan from the engineering firm Arup, the 400-acre island would be home to 6,000 new apartments and condominiums surrounded by large buildings along the San Francisco coastline. The homes—and the adjacent businesses they supported—would get 50 percent of their power from renewable resources, including solar electricity and solar water heaters. In fact, the compact street grid has been oriented 35 degrees north of due south to maximize the exposure of the rooftop photovoltaics to sunlight—as well as to enable the structures to shield residents from brisk bay winds. All the buildings would be within a 15-minute walk of a ferry terminal to San Francisco. And residents could obtain much of their fresh produce from a local organic farm that would use as fertilizer the waste from the water treatment plant already on the island. Dongtan: One of the earliest eco-cities announced may take longer than anticipated to complete. In August 2005 the Shanghai Industrial Investment Corporation hired the engineering firm Arup to design an “eco-demonstrator” satellite city for the booming coastal municipality. It would be anchored on Chongming Island, China, one of the largest alluvial islands in the world, which has been steadily expanding because of heavy silt runoff at the mouth of the Yangtze River. The planned community would start small but reach full size—at least 500,000 residents—by 2050, all while maintaining much of the natural wetlands that provide one of the few remaining refuges for birds in the rapidly developing country. Among the first eco-cities ever announced, Dongtan was planned to be zero waste, energy-efficient, powered largely by sea breezes and free of vehicles running on fossil fuels. But construction has been delayed until at least 2009, largely because of the torrid pace of development in other areas of Shanghai, according to Roger Wood, a director at Arup. The bridge and tunnel link to the mainland, now being built and due for completion in phases beginning in 2009, “will be one of the catalysts for development starting,” Wood says. He remains enthusiastic about the project because Chinese leaders, both locally and in the central government (among them President Hu Jintao), have urged a new focus on construction that is more ecological. In addition to Dongtan, Arup is involved in planning at least four more eco-­cities in China, including the revitalization of the old steel town Wanzhuang in Hebei Province between Beijing and the port city of Tianjin. Masdar: Oil wealth fuels construction of an ecologicalcity in the Arabian desert. 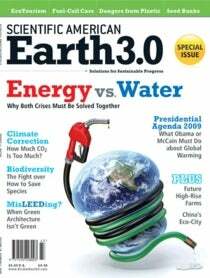 Note: This article was originially printed with the title, "Eco-Cities of the Future". David Biello is an associate editor reporting on the environment for ScientificAmerican.com.